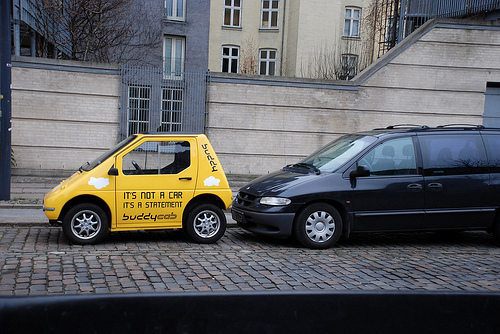 Little car, big statement, on the streets of Copenhagen. Photo by america.gov. Copenhagen’s COP-15 meeting came and went, and now, it’s down to the details of figuring out how to implement the commitments and plans for action. A new draft report about the applicability of post-2012 instruments to the transport sector was released this month by the Asian Development Bank, Inter-American Development Bank and the Partnership for Sustainable Low Carbon Transport. The report – and related subject matter – will be discussed at the upcoming Transforming Transportation event, “Next Steps After Copenhagen,” held in Washington, D.C. on January 15. Download a copy of the report here: CITS Interim Report draft 11 December. Generate Emission Reductions which count against mitigation targets for developed countries. This includes continuing the Clean Development Mechanism (CDM beyond 2012, but with certain modifications to enhance scale of emission reductions, lower barriers and reduce transaction costs. Generate Emission Reductions which can be reported directly by developing countries to UNFCCC. The instrument being discussed for this purpose is Nationally Appropriate Mitigation Actions (NAMAs). 2. The post 2012 Climate Instruments in the transport sector (CITS) project implemented by the Asian Development Bank (ADB), in cooperation with the Inter-American Development Bank (IDB) is a first step to help ensure that the transport sector can benefit from the revised/new climate change mitigation instruments under a post-2012 Climate Change Agreement. The CITS project is a contribution to the Partnership on Sustainable, Low Carbon Transport. c) Development of an informal network, spanning both developed and developing countries, of transport organizations to help guide the discussion on detailed guidelines for post 2012 climate instruments. 4. Although the implementation of the project is still ongoing and the case studies have not been completed it was decided to produce an interim synthesis report to inform the discussions on post 2012 climate instruments at COP 15 in Copenhagen. The interim report can also serve to obtain inputs and feedback for the final report of the CITS project which is expected to be available by May 2010. 5. The format of the interim report is as follows. Chapter 2 gives an overview of the abatement potential of various types of interventions in the transport sector. Chapter 3 reviews the existing climate instruments and related climate change programs for their effectiveness andrelevance to the transport sector. An overview of the discussions on post 2012 climate instruments and their significance for the transport sector is given in Chapter 4. A synopsis of the four case studies carried out under the CITS project is given in Chapter 5. Initial conclusions and recommendations are presented in Chapter 6; this chapter also outlines the next steps to be taken in the CITS project prior to its completion in May 2010. 6. The report was written by Cornie Huizenga, Partnership for Sustainable Low Carbon Transport and Stefan Bakker, the Energy Research Center Netherlands with support from the authors of case studies: EMBARQ/Word Resources Institute (Dario Hidalgo), for the Belo Horizonte case study; Wuppertal Institute (Frederic Rudolph) for the Hefei case study; Transport Research Laboratory (Holger Dalkmann and Ko Sakamoto) for the Jakarta case study; and Ecofys (Martina Jung) and for the Mexico case study). The CITS project is guided by Jamie Leather and Sharad Saxena in ADB and Rafael Acevedo-Daunas, Maria Cordeiro and Vera Lucia Vicentini in the IDB. 7. Comments on this draft interim consultants report can be addressed to Cornie Huizenga (cornie.huizenga@slocatpartnership.org) and Stefan Bakker (bakker@ecn.nl).